Since 1992, our team members have been involved in the discovery or recovery of many clips from missing Doctor Who episodes. No clips were thought to exist from this episode until they were rediscovered in a wrongly labelled film can in the BBC Film and Videotape Library in late 1991. The clips were discovered accidentally by Steve Roberts, who at that time was involved in film transfer work in preparation for the 'Resistance is Useless' compilation. The film can that had been ordered from the library was supposed to contain 35mm film sequences from episode two of the story, featuring the Daleks burning down a forest. However, once the film was put on the telecine, it became obvious that the film was actually from episode one, as it featured Kert Gantry being shot by the Daleks, the TARDIS materialising and Mavic Chen's spacecraft 'Spar' landing. Although this was a good find, it was somewhat offset by the fact that the film sequences from episode two had gone missing from the library! It later transpired that they had been stolen. Subsequent research leads us to believe that the original negatives of the episode one film sequences were always in the library, but had been mistakenly labelled as being episode two - presumably because the episode two print was similar in both length and content. When the episode two film was stolen, the library system flagged that a new print was required, so the negative was called up and duplicated - but it was really the negative for episode one! This is why a brand-new film print of the episode one sequences ended up in the episode two can. As mentioned above, the 35mm film sequences from this story had been stolen from the BBC Film and Videotape Library. They had been bought in good faith by a private film collector who had no reason to believe that they had been stolen. It wasn't until reading an article about the making of 'Resistance is Useless' that he realised he was holding stolen property. He immediately contacted Paul Vanezis and handed the film back to him. We were able to return the film to the then BBC Archive Selector, Adam Lee, just as he was about to walk onto stage for the first of the 'Missing - Believed Wiped' conferences at the National Film Theatre - a fitting start to the proceedings. A clip from this episode was discovered in an edition of 'Blue Peter', used as an introduction to an item about the return of the Daleks in the forthcoming story 'Day of the Daleks'. It had been discovered during a routine transfer of the original two-inch quad studio recording tape to D3 digital videotape as part of the BBC's huge Quad archiving project. A number of additional clips from this story have been recovered since 1993. The first was a six second clip from the last episode, discovered during research by Andrew Pixley and Kevin Davies for 'Thirty Years in the TARDIS'. The clip featured in a programme about the BBC Radiophonic Workshop. An additional series of clips was recovered from the Australian Broadcasting Commission in 1995. 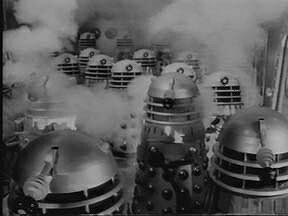 It was relatively well known that an Australian programme called 'C for Computer' had included footage from this story, including an infamous shot of the 'Dalek Production Line'. The BBC had tried to recover this material before, but had no success in tracing it. However, work by Robert Mammone in Australia and Steve Phillips in England produced the full title - 'Perspectives - C for Computer' and more crucially its transmission date. This information was passed to Steve Roberts, who contacted ABC Archivist Caitlin Hickie. 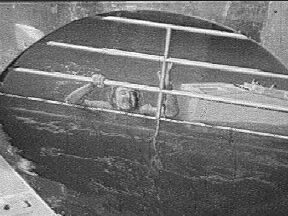 Initially, it appeared that the transmission tape had been destroyed in the mid-seventies, but perseverance by Hickie uncovered film cans containing the title sequences for the programme. Paperwork in ABC's programme file mentioned that the opening sequences contained shots of Sydney Opera House and sound from Doctor Who. As it was unlikely that just a soundtrack would be used, Hickie was persuaded to view the prints and discovered the previously missing clips, which were transferred to videotape and returned to the BBC. Two brief clips were discovered by Steve Roberts during research for 'Thirty Years in the TARDIS' in 1993. They were contained within an article on the BBC Visual Effects department, in an edition of the sixties arts show 'Late Night Line-Up'. 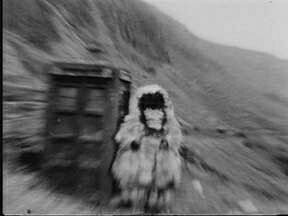 The first clip is a very fast zoom onto a yeti stood by the TARDIS, the second is a group of yeti escorting a man up the mountainside. 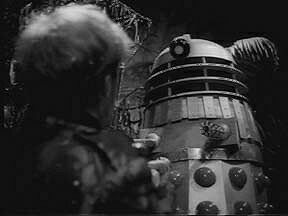 The first clip was included in the 'I Was That Monster' vignette screened as part of the repeats of 'Planet of the Daleks' in 1993. The rest of the 'Late Night Line-Up' article included a tour of the BBC Visual Effects Workshop, where many Doctor Who props could be seen working, including Cybermats and a Cyberman whose head exploded and emitted foam! Approximately one minute of this story was discovered in its original PAL colour format by Paul Vanezis, acting on a tip-off from DWM archivist Andrew Pixley, on a two-inch quad insert tape for the magazine programme 'Nationwide'. It was featured in an article about Katy Manning, who played the Doctor's assistant Jo Grant, leaving the programme. The restoration team were gratified to find that when they compared their recolourised version of the story with the clip, they were a reasonably close match! In late 1996, Steve Phillips contacted Steve Roberts with news that several minutes-worth of previously missing clips had been uncovered at the Australian film censors office in Sydney. The Office of Film and Literature Classification were contacted, but appeared unwilling to help. Two weeks later, BBC Television Archivist Christine Slattery was contacted by Australian fan and researcher Damian Shanahan, whose research had been responsible for the discovery. He was put in contact with Steve Roberts and proved extremely helpful in the eventual recovery of the material back to the BBC. Shanahan had discovered that material physically cut from BBC prints prior to their release to ABC TV had been stored in a vault at a branch of Australian Archives, a government document repository, near Sydney. The find included clips from such previously unrepresented stories as 'Fury from the Deep', 'The Macra Terror', 'The Highlanders' and 'The Smugglers', as well as clips from other missing episodes. Recovery of the material took much longer than expected, mainly due to the Australian government being strangely obstructive. Initially, they refused to allow the film clips to be returned at all, stating that they were "Commonweath Property". They relented somewhat when gently reminded of the terms of the original contract between ABC and BBC Enterprises, which stated that the film "remained at all times the property of the BBC" and that it should have been returned at the end of the original contract period. In the end, permission was given for the film clips to be copied onto videotape and returned to the BBC in that form - an acceptable compromise, given the delicacy of the situation. Full details of all the clips mentioned in this article, along with details of every other known clip from missing episodes, can be found on Steve Phillips' site.